You are here: Home / Shooting Tips / Home Defense / Shooting Myth: A Laser Will Only Give Away Your Position! Shooting Myth: A Laser Will Only Give Away Your Position! The benefits of surefire aim in low-light conditions and flexibility for shooting from unconventional positions far outweigh any realistic risk of “giving away your position” when using a firearm-mounted laser. I’ve been a big fan of lasers on handguns for years. At first, this was because they sounded great on paper. After actually running around shooting in the dark at various training events and nocturnal competitions, my “fanboy” meter has maxed out. But to be really clear, I want to stress that I am talking about gun laser applications for home defense and self-defense. Not door kicking in Afghanistan. Or serving no-knock warrants with the Department of Education’s new SWAT Team. Or anything else “offensive.” See what I did there? I’ve had all sorts of responses to my discussion on lasers for home defense. One commenter informed me that a laser would clearly show my position and a sniper positioned 600 yards away, who would subsequently easily take me out. I don’t know about you, but I don’t anticipate this event in my home defense scenario—at least until civilization breaks down into a post-apocalyptic battle zone. I’ll take the risk that my burglar has not had the foresight to set up sniper overwatch in the nearest cell tower. To put the discussion in perspective, let’s walk through a potential home defense scenario. It’s the middle of the night. It’s pitch-dark. You are sound asleep in your bedroom. You are awakened by the sound of crashing glass, which indicates someone has just entered your house. By the time you wake up and figure this out, they are probably already in your house. This is a defensive, not offensive, situation. Now what? I don’t know about you, but my goal is simple. Get that person and/or their friends out of my house before they cause harm to me and/or my family. If that person happens to get hurt in the process of achieving the goal, then that’s an occupational hazard of breaking into peoples’ homes in the middle of the night. But that’s not my primary goal. Encouraging them to turn tail and leave is far easier for all involved than splashing them all over my new duvet cover. In order to think through my best plan for home defense, I’ll take this goal into consideration first, then apply the most likely scenarios I might encounter. Most likely scenarios. This is where folks get all wrapped around the axle when it comes to using gun-mounted lasers. Stop and think for minute about the most likely scenario you could encounter in your home. Who is that person that just broke into your house? Is it a team of trained ninja marksman who intend to engage in a cat-and-mouse running shootout in your home, just like on TV? Were you waiting in your laundry room sniper hide anticipating their arrival? Maybe, but not likely. The more likely scenario is that some crackhead is looking to steal your Xbox to fund their next fix. And they woke you up. And they’re already in your house by the time you get your wits about you and get moving. 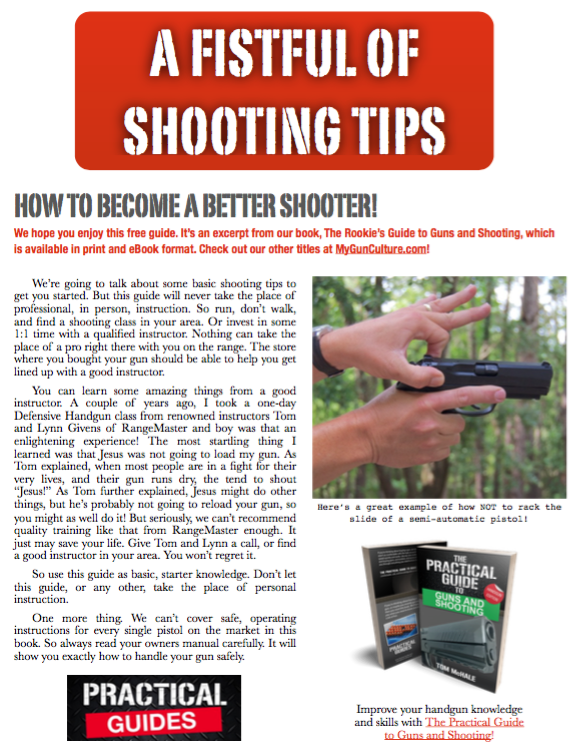 While you’re here, why not grab a copy of my free eBook, A Fistful of Shooting Tips? It’ll help make you a better handgun shooter and the envy of your range in no time!